“Spot on”, tweeted Home Secretary Sajid Javid (no doubt a little pressed for time). So the freedom to hold parliamentary prayers must give way to the freedom to be free of them, even though they are not mandatory. So praying in the Chamber where non-praying Members may wish to sit is imposing prayer upon them. Non-believers are not forced out: Members are perfectly free to enter the Chamber at the commencement of prayers, and sit and observe should they wish to do so. What they are not free to do is interrupt proceedings once they have begun by noisily coming and going, so the Chamber is locked. Yet parliamentary prayers must be abolished, they aver, because they force non-believers out of a formal part of a formal session: prayer is absolutely nothing to do with business. Except that parliamentary prayers have been part of the business of Parliament for 500 years. The Palace of Westminster is not a ‘secular’ space from which God is excluded; it is a royal palace, housing St Mary Undercroft, a royal peculiar. The Church of England is established (like it or not, that is the Constitution), and three quarters of MPs taking their seats swear their Oath of Allegiance to the Head of State (who, like it or not, happens to be Supreme Governor of the Established Church) on a religious text (250 choosing to do so on the Authorised Version [which is heartening]). Parliamentary prayers are open to politicians of all faiths and none; the Rev’d Rose Hudson-Wilkin is chaplain to MPs of all faiths and none. Parliament is her parish; MPs are her parishioners, and she serves them and ministers to them all – including Crispin Blunt. He pretends that his gripe is with using parliamentary prayers as a seat-reservation device: Members who attend prayers get to reserve a seat for the following session, but (importantly for Mr Blunt) Members who would have attended prayers if they hadn’t been in (say) an unavoidable committee also get to reserve a seat: they would have worshipped in spirit and in truth if they could, but democracy comes first. Mr Blunt therefore dissembles: he writes ‘Committee’ on his pink card and spends another hour in Annie’s Bar. He resents having to do this (not least because it may cause people to doubt his integrity: if he is prepared to lie about his spirituality in order to get a ringside seat, what will he say to get your vote?). This is not, of course, anything to do with seat-reserving: the National Secular Society wants the Church of England to be disestablished; Bishops ejected from the House of Lords; the Queen to be stripped of her religious role, and the whole Anglican edifice to be dismantled. Crispin Blunt chipping away at parliamentary prayers with his cantankerous chisel is simply the first step: the super-objective is secular hegemony. Parliamentary prayers are (it must be said) a little quirky. Members enter in procession with the Chaplain and Speaker who both kneel at the Table of the House while Members stand at their places with their backs to the Chamber, facing the wall. The practice is thought to derive from parliamentarians’ swords preventing or hindering kneeling: it was simply easier to face the wall, kneel on the bench, and let your sword rest on the back of the bench behind you. Whatever the origins, turning away from the Chamber facilitates apprehension of the transcendence and immanence of God, rather like closing one’s eyes in church. The mind is more easily focused on personal motives or the needs of others, or on the reality, wonder and joy of life, or on the honour and weighty responsibility of being a legislator. 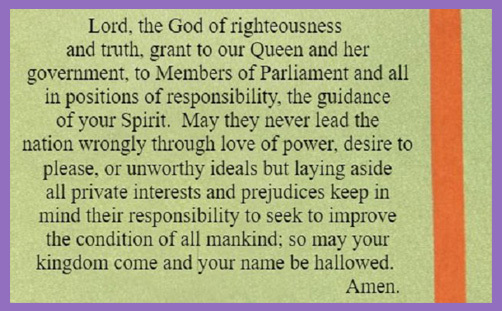 Parliamentary prayers clearly edify those who participate, reminding them that, while Parliament may be constitutionally omnipotent, there are limits to the exercising of power: pride will be judged – if not by God, by the Ballot Box. The prayers thereby become a check on vanity, on self-centredness, on the urge to lord it over others, and on the relentless drive for personal success and greasy-pole-climbing. Some MPs seem to have more appetite for attention-seeking than for service, and prayers are an opportunity to check one’s own propensity to be puffed up or stiff-necked. At heart and in essence, parliamentary prayers are an expression of submission to something greater. For theist Members, that greater is God; for non-theist Members, it is the greater force of life and love which mitigates the temptation to self-absorption and self-love. The prayers exhort both Christ-centredness and the Noble Eightfold Path: right view, right aspiration, right speech, right action, right livelihood, right effort, right mindfulness, and right concentration. Why should there be any need to deny this good or defy this transcendence with a crass EDM coup just to make a few MPs feel more comfortable? …those of us who have experience of the Westminster Parliament would not want to reproduce the nature of prayers in that institution, where they have been described as a meaningless ritual. 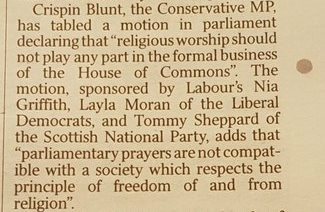 That is not altogether true, because prayers in the Westminster Parliament can be meaningful as a means for people to reserve their seats for the day. However, I am not certain that that is the best reason for people to take part in what should be a solemn observance of worship. By all means let us rule out the House of Commons model. I was there for eight years. Lord James Douglas-Hamilton said that there was no compulsion to attend prayers, but I found that there was: if I wanted a seat, I had to pray. That was not a very dignified situation, but there were not enough seats to go around. We are blessed here – we all have a seat and a desk – so that will not happen. There were some comic elements at the House of Commons, the first of which was that we were locked in to pray. The first time I went to a question time, I found everybody queueing. When I asked old Mr Emrys Hughes what was happening, he said that members had been locked in to pray. That sounded very strange. I liked it, but it was the same every day. We should have a new model and we should embrace all the cultures and religions that have chosen Scotland as their home. At Westminster, the vast majority of people who do not have a religious faith hang around in the corridor during prayers. As soon as prayers are over, there is an almighty rush to get into one’s seat. There has to be a gap between the end of prayers and the start of business to allow the large majority of members – I suspect – to get to their seats. …We are all a little ambivalent about these matters. I was much entertained by Dr Ewing’s account of her experience of having to pray in order to get a seat in the House of Commons. The implication of that was that if she could have got a seat without praying, she would have done so, and yet she stresses the absolute necessity of having prayers before every meeting. i) Allow members to reserve seats whether they attend prayers or not: it is time to separate divine communion from sedentary banalities. Better still, end the practice of reserving seats altogether: make it first-come-first-seated, which would be more equitable. Even better, allow the building to shape the legislature: cut the number of MPs to the seating capacity of the Chamber, so no one has to stand while their colleagues drone on. ii) Make it clear that Members may be participants in parliamentary prayers by standing, or participant-observers by sitting, and that both postures are acceptable to God (whether they believe in Him or not). The Queen’s Majesty hath the chief power in this Realm of England, and other his Dominions, unto whom the chief Government of all Estates of this Realm, whether they be Ecclesiastical or Civil, in all causes doth appertain, and is not, nor ought to be, subject to any foreign Jurisdiction (Article XXXVII). These few procedural tweaks would blunt Crispin Blunt’s chisel and frustrate the National Secular Society’s axe-grinding. If he still feels ‘uncomfortable’ or ‘excluded’ by the practice of parliamentary prayers, he needs to understand that not all have reached his superior level of secular enlightenment, and that some Members find prayer an edifying therapy and worthwhile exercise for sifting the moral reason of centuries and discerning the reality of truth in a parliament of fading dreams. They are a reminder that there are limits to human moral competence; that God’s voice might just be worth hearing when major ethical issues are being debated or momentous decisions contemplated. If it assists him, Crispin Blunt might compassionately view people of faith as being somehow ‘intellectually disabled‘, and he wouldn’t want to discriminate against the poor in spirit, would he?